Even if we assume that the political system is fair and all politicians do their work in the best interest of the people, the representative democracy will automatically turn into a minority rule. Here is why. BTW, the model and diagrams used in this essay have been made with Klong. Let's assume for a moment that a political landscape could consist of multiple parties with the votes distributed normally among them. 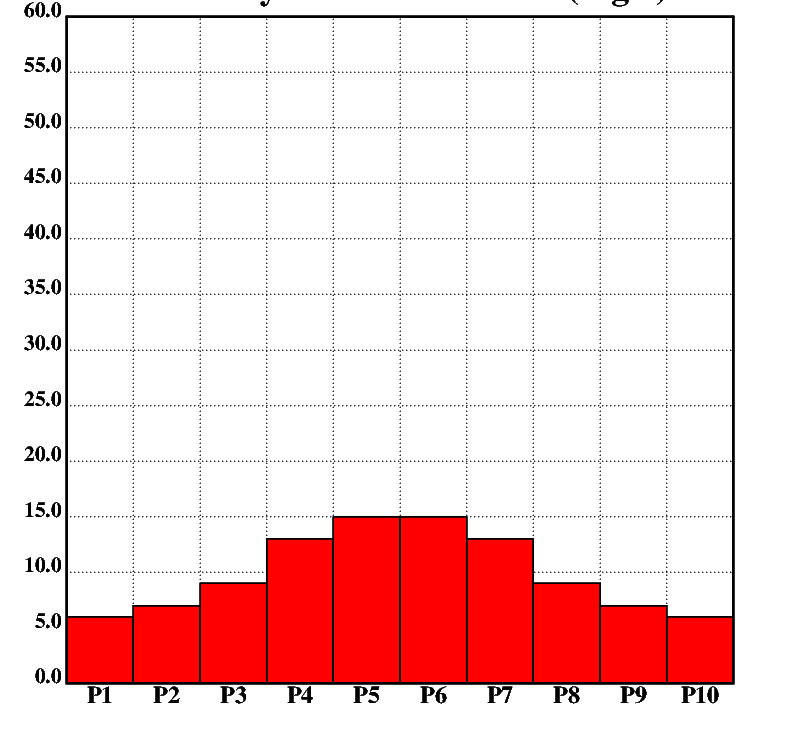 Fig.1 shows such system with ten parties. 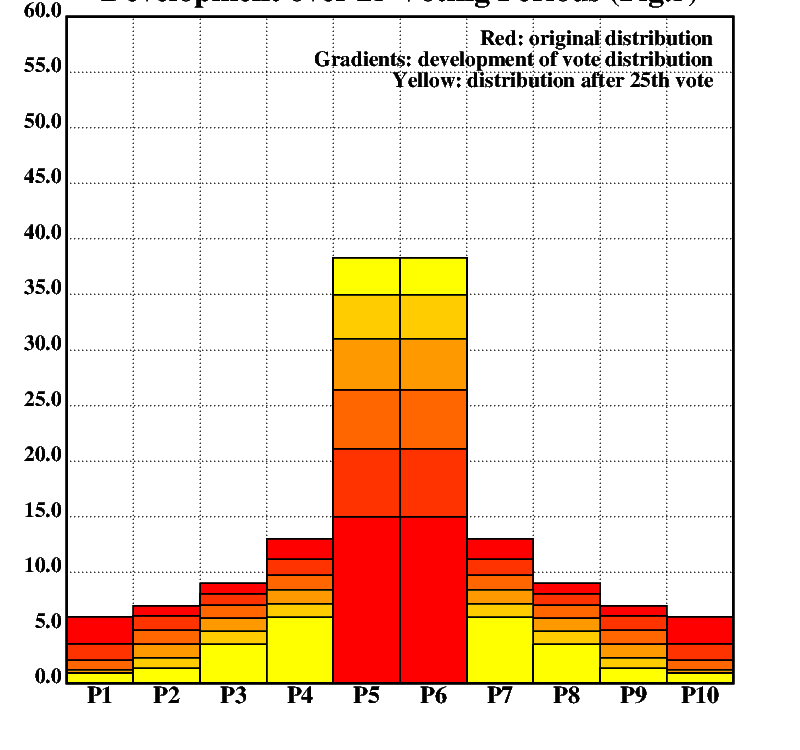 The x-axis indicates parties (named "P1" through "P10") and the y-axis shows the percentage of voters per party. 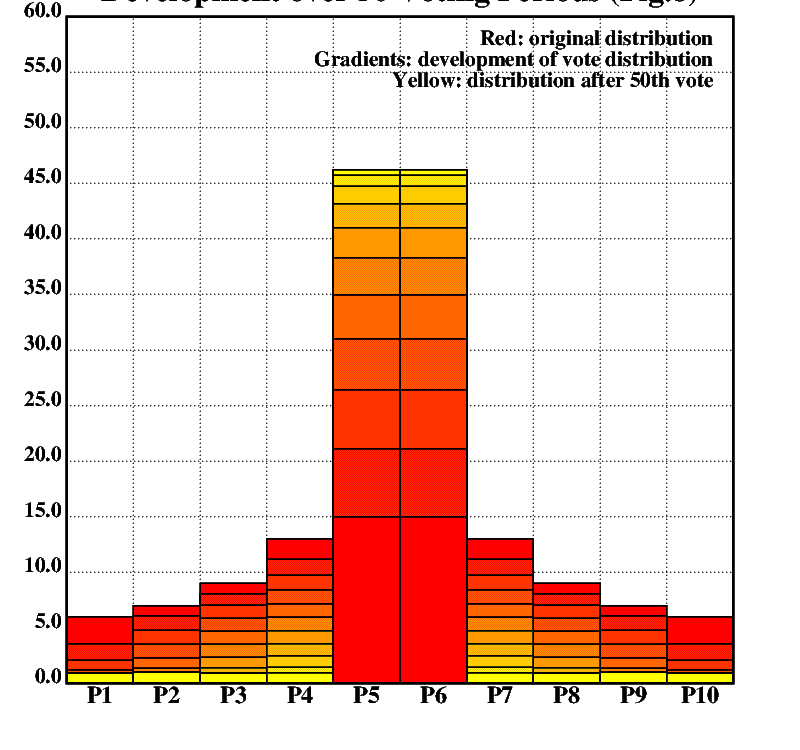 The smallest parties have the support of around 5% of the voters and the largest ones each collect about 15% of the votes. Let us also assume that 10% of the voters will be ready to trade satisfaction for influence, i.e. they will consider voting for a party that collects more votes, even if it represents their interests only partially. 1% of the voter will stick to their favorite party, no matter how few votes it collects. 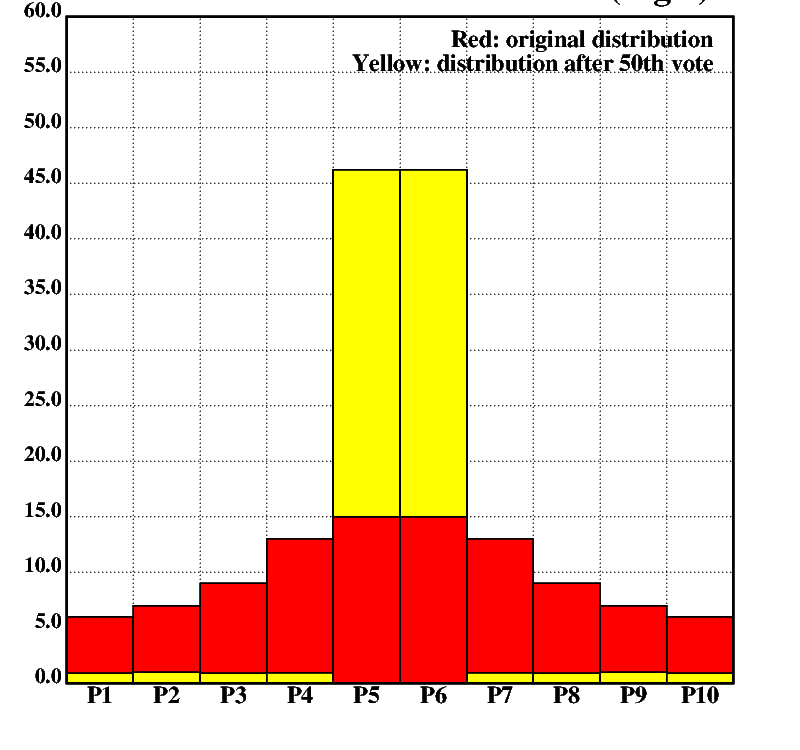 During the next vote, the following will happen: 10% of the voters will trade a certain degree of satisfaction for an increase in power, so they will vote for a party with more voters. Note that the opposite thing will never happen because, originally, all voters were perfectly represented and moving to a smaller party with lower satisfaction makes no sense. 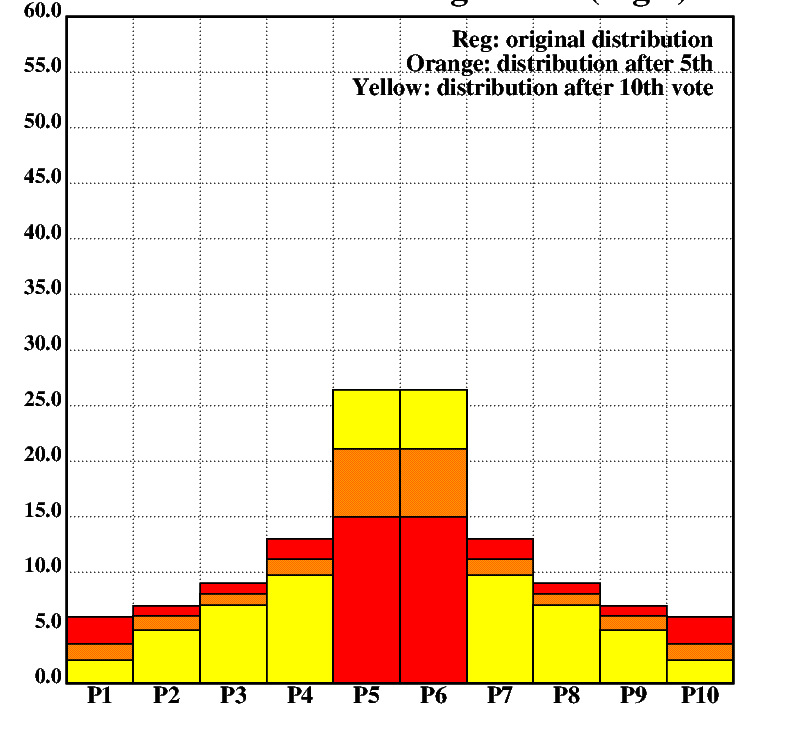 In fig.2, 10% of the voters per party will move to the next bigger party. 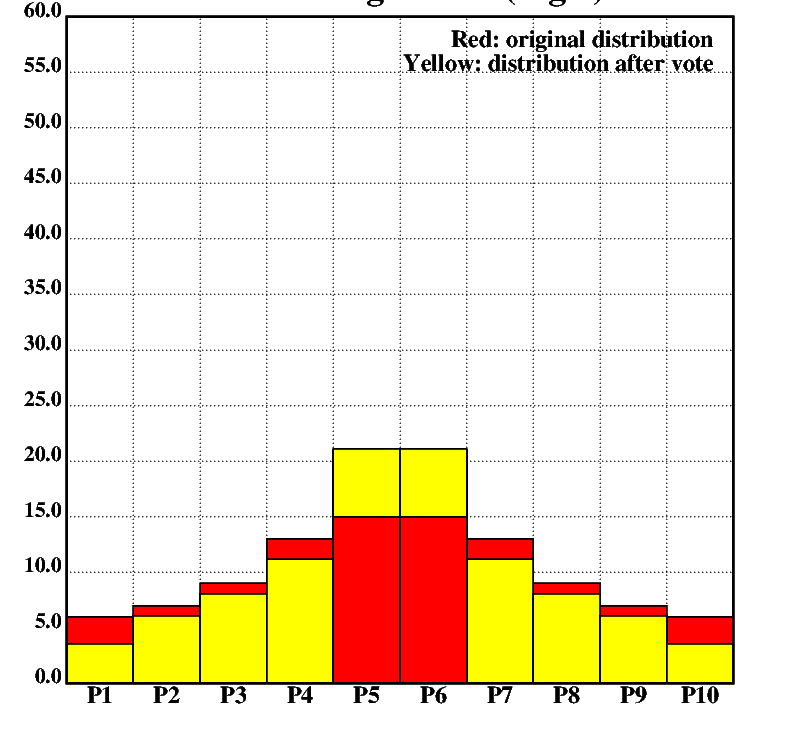 The original vote distribution is displayed in red, the new distribution after the vote in yellow (although on a phosphor CRT, they will appear as different shades of green.) 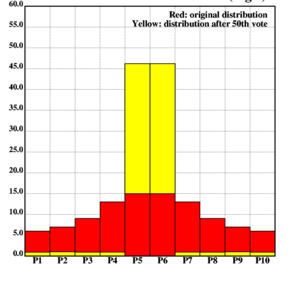 All small parties lose a few votes and the center parties gain votes. The effect becomes more visible after five voting periods (fig.3), when the center parties have gathered a lot of votes and the fringe parties start to lose votes rapidly, because they cannot get new voters from parties even further removed from the center. As the parties around the center accumulate voters, the incentive for moving to a more powerful party increases, even if that that party represents only a subset of a voter's interests. For the sake of simplicity, though, we will assume that the number of voters who are willing to switch parties remains stable at 10%. 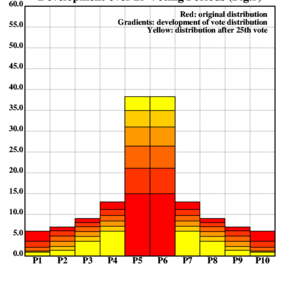 As the development of the political landscape progresses, the parties around the center gain more and more popularity while the fringe parties struggle with marginalization (fig.4). We will consider a party to be marginal when it collects less than 3% of votes. After only 5 voting periods P1 and P10 have become marginal and continue to lose votes. This part of the development is often a fixed point, because voter fluctation among the small and large parties keeps the political landscape in motion. Both voters and parties may shift across the left-right spectrum. Small parties and marginal parties may change, but the system aways remains a two-party system at its core. In this case, figures 6 and 7 show the final vote distribution of the system. Figure 6 contrasts the original distribution (red) with the final one (yellow) and figure 7 shows the marginalized voters in red. They are marginalized, because no party represents them, even if they vote for one of the remaining options. In this configuration, this is about 47% of the voters. Because each of the large parties forming the government alternatingly collect less than 40% of the votes, this form of government is in fact a minority rule. 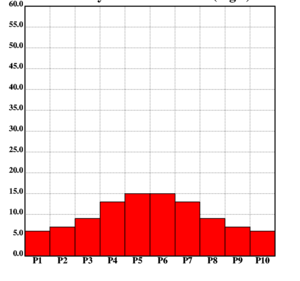 Sometimes there is no fluctuation and no small parties will be able to enter the game at this point. In this case the system collapses further and eventually becomes a pure two-party system (fig.8, fig.9), as it can be observed in some countries these days. All other political forces are gathered under and umbrella name and are mostly irrelevant. In this case, about 62% ofthe voters are not represented by any of the two parties. Of course, there is a simple way to find out about voters dissatisfaction: add a "none of the above" (NOTA) option to the voting ballot. 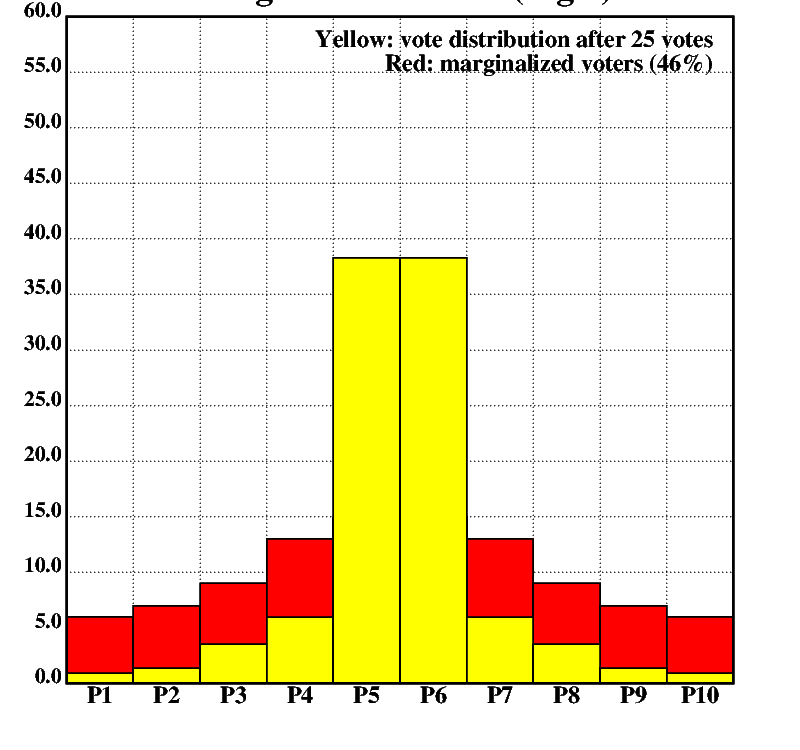 At the moment, most countries do not distinguish between non-voters (voters that do not vote for whatever reason), blank voters (voters who vote blank or invalid out of protest), and protest voters (voters who vote for marginal and or radical parties out of protest). 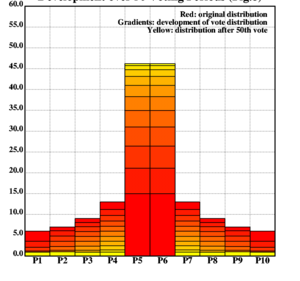 It is a wide-spread opinion that non-voting or blank voting is a sign of incompetence or lack of interest, but research indicates that blank-voting in particular is often performed by highly educated, well-informed, and politically interested people. See the bibliography of this research plan for references. Published here with permission of the author.